Outer Limits expresses the idea that space and time are not fixed, but are endlessly evolving entities with incomprehensible possibilities. Texture and dimension are incorporated into the sculpture through build-up pads created by welding students at Janesville-Waldorf-Pemberton High School. “Being an Industrial Arts instructor is a profession that I chose for many reasons. It gives me the freedom to be creative, the chance to help others, and the opportunity to be a leader. “Recently, the creative aspect of my teaching profession has compelled me to experiment artistically with different media. For as long as I can remember, I have made furniture, welded projects, constructed buildings, poured concrete, and repaired mechanical equipment. This hasn’t changed, but now I let the materials I’m working with guide me to the final product. Art has profoundly affected the life of Tim James for as long as he can remember. He started creating artwork realistically, until a two-year journey to Athens, Greece influenced a transformation to abstraction. James was born in Mankato, Minnesota. He received his Master’s Degree in Experiential Education and his Bachelor of Science in Art Education from Minnesota State University, Mankato. His artwork can be found in a variety of media around Southern Minnesota including six pieces in the permanent collection at South Central College and at several public sculpture venues in the Midwest. His work has been featured in numerous solo and group exhibitions over the years, and he has been the recipient of regional awards. 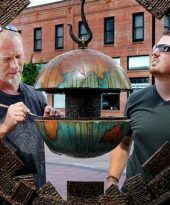 Much of Tim James’ inspiration comes from being an art teacher at Janesville-Waldorf-Pemberton.